Size: 5.9" x 3.0" x 0.50"
Together with the new housing the "chip-on-board" or COB-technology was introduced in the manufacturing process. We know this technology already from the PS-2100 Databank introduced in 1992. The calculator chip is attached direct on the printed circuit board and connected with small bond-wires. A small blob of epoxy resin on top finishes the construction. Don't miss a TI-36X Solar manufactured in Italy with a completely different internal construction. The next step in this calculator line is the TI-36X II with a two-line display. In Germany this calculator survived with a new marketing concept. View the TI-36 eco RS. 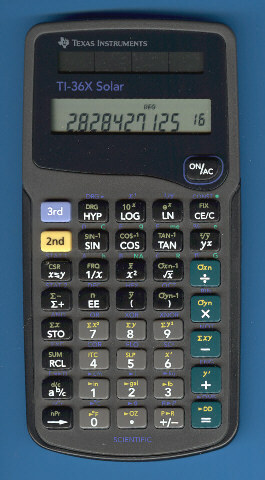 Texas Instruments introduced in May 2004 without any announcement the complete redesigned TI-36X SOLAR and gave a first outlook to the impressive design of the BA II PLUS Professional.